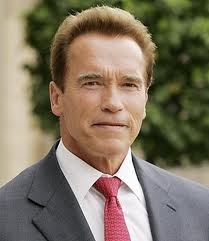 At a MIPTV press conference this morning, Arnold Schwarzenegger added a 3D feature film to rollout plans for his multi-platform project The Governator. The film is part of a plan that will include an animated TV series, a comic book and Internet programming. The feature film will be ready in early 2013, said A Squared Entertainment's Andy Heyward, who launched the project along with Schwarzenegger and Stan Lee, the producer behind the project. He told Deadline that it all starts with a 52-episode series that will feature the voice and animated image of Schwarzenegger as a superhero bent on beating the bad guys and the forces of evil. Schwarzenegger, who received the Legion d’Honeur this morning in Cannes, came wearing his signature cowboy boots. Now “termed out” in his former job as California's governor, he said he was happy to return to Cannes to announce his return to acting. Cannes is where his acting career launched in 1977. "In public life when you are governor, you have to deal with keeping the beaches clean and making sure there is enough funding for the after-school programs and lunch programs," he told the packed press conference. "But as an action hero, you just have to save the world." Schwarzenegger was seated in front of a sign with his animated image as the Governator that said simply: "I’m back." When asked if The Governator would take on the likes of Libyan leader Moammar Gadhafi, Schwarzenegger paused to think a bit. Said Schwarzenegger: "Who knows? I don’t want to make headlines, that means you won’t write about The Governator. That might be going in the wrong direction. But the way things are going, we may have a chance of selling our series down there."